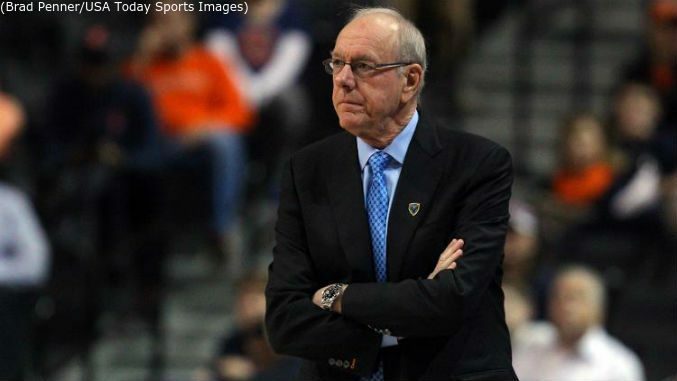 WHAT HAPPENED: Syracuse (17-8, 8-4) dropped only its second road game in the ACC this season, but it hurts a lot with only six regular season games left to play, and half of those are against Duke, North Carolina, and Virginia. SU did not score its first basket until almost five minutes into the game, only trailed 30-27 at the half and came within one point early in the second half. Then, NCSU (18-7, 6-6) went on a 14-0 run with 60% plus shooting to pull away, and stymied the Orange half court offense the entire evening. ANALYSIS: In a crazy game from a Syracuse lineup standpoint, with 10 Orange players hitting the court in the first half, the offensive struggles and lack of any sort of inside game continued to haunt SU. The ‘Cuse was just 5-25 (20%) beyond the arc, and Tyus Battle (seven points) struggled to get his offensive game going, and played with four fouls much of the second half. Frank Howard was the only reliable SU offense on this night with a co-game-high 21 points and hit all five of the Orange treys. The ‘Pack had a strong inside-outside game with forward DJ Funderburk and guards Braxton Beverly and Torin Dorn combining for 49 points, and overcame 20 turnovers to still win comfortably. HERO: Sophomore guard Beverly torched the ‘Cuse from the outside in the first half, finished with four three pointers for a co-game-high 21 points, was 9-9 from the foul line along with four assists. ZERO: Syracuse did have its opportunities at the foul line to stay in the game for 30 minutes, but could not convert enough points finishing 11-22 from the line. The Orange was also out rebounded by 11 boards, and gave up 28 points inside the paint to the Wolfpack big men. WHAT’S NEXT: Syracuse has its final one week break between games, not returning to action until next Wednesday night, Feb. 20 hosting No. 16 Louisville at the Dome. The Cardinals (17-8, 8-4) suffered a tough loss to Duke Tuesday night blowing a 10 point lead late, and host Clemson this Saturday. Game time: 7:00 p.m. ET / TV: ESPN.